The drive to the South Holston is always a bit tedious, but so far it is always worth it. This past Tuesday was definitely not the best day to be fishing a technical river, the sun was bright, the water low and clear, and the air temperature was COLD. The majority of the day featured temperatures cold enough to ice up our guides, requiring dipping the rod in the river every few minutes. Still, experiencing a good hatch at this time of year (of something OTHER than midges), is worth whatever minor suffering we experienced. I got to fish with Travis again and this trip proved to be a little more successful from a catching standpoint. We both got things started early with an assortment of soft hackles, midges, and even a couple on eggs. As the day warmed, we started thinking about those sulphurs that the river is famous for. Rumor had it that the bugs were still coming off in good numbers, and we were determined to get in on the hatch if at all possible. Finally we found an good unoccupied stretch of water and slipped into the river. Almost immediately, a few explosive rises alerted us to the possible hatch. Sure enough, there in the slack water near the banks, a few duns were sitting bravely, trying to figure out what to do now that they were out in the cold air. The fish were having a great time. Cold weather has always produced some phenomenal dry fly action for me. Hatches are often sparse to non-existent, although any hatch that does happen is a perfect feeding opportunity for the fish. The cold air makes it harder for the insects to fly away, so instead they sit on the water until something eats them. This was definitely the case on the South Holston. So what better to do than tie flies and reorganize gear? That is basically what I'm doing this evening...already tied several flies and thinking about reorganizing all my fly boxes. Several boxes are starting to get really disorganized, not to mention I have a new box to move into the rotation. I normally do this with my fly boxes about once a year, sometimes more if I have a really big trip. For awhile I've been wanting to do a complete different set of boxes for the mountains and tailwaters. Right now I'm still a box or two short of being able to make that happen, but I'm definitely getting close. The statistical rarity, in this instance also known as a white Christmas, looks to be coming to Tennessee this year! The National Weather Service has issued a "Winter Weather Advisory" for our area highlighting possible snow and perhaps a bit of sleet, so it looks like our chances for at least a little of the white stuff is fairly good. I have only seen 2-3 in my life so it is a nice addition to an already great holiday. When it comes to favorite places to fish, Yellowstone National Park should be high on everyone's list and I know its definitely one of mine. From small backcountry streams full of feisty trout that slam dry flies to big mature rivers where the fish can be measured in pounds instead of inches, not to mention the numerous stillwater options, Yellowstone offers something for everyone. Unfortunately, much of the Yellowstone ecosystem is in danger. Back sometime in the 1980s, lake trout were introduced to Yellowstone Lake (how remains somewhat a mystery, at least according to the Park Service, although plenty of theories abound). By the time they were noticed, a well-established spawning population was in place. Since then, the numbers of lake trout have skyrocketed while the native Yellowstone Cutthroat have been decimated. I was reminded of all this the other day from James Marsh. In his daily journal article, he mentioned that a new Fish Conservation Plan was on the table and open for discussion. I checked out the plan, did a lot of reading, and came to a few conclusions. First, I suggest you read the plan for yourself. Generally, I am all for native species restoration although sometimes it is difficult for me to get too excited. 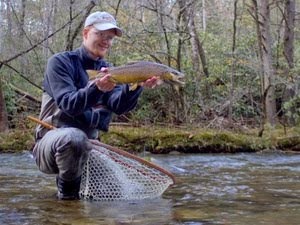 Lynn Camp Prong here in the Smokies is a great example. I'll be glad to fish for brookies on such a good-sized Park stream but am sad about all the years I'm missing out fishing while the water is closed for the restoration. In Yellowstone, I feel that a lot of effort has been put into the Environmental Assessment resulting in generally sound conclusions. Overall I agree whole-heartedly in the need to help the native fisheries, particular Yellowstone Lake. The current work done to control lake trout is just not sufficient. Clearly something needs to be done, and I applaud the Park Service for taking on the daunting project. My one concern with the plan is for the Gibbon River. There are currently many options throughout the Park to fish for native cutthroat. According to the Park's Fish Conservation Plan, the upper Gibbon was historically fishless. David Starr Jordan did the first survey of Yellowstone fish in 1889 and published his findings in 1891. "He described 40% of the park as the 'Area Without Trout,' including the upper reaches of the Bechler, Fire Hole, Gibbon, and Gardner Rivers" (Fish Conservation Plan, p. 4). In the current plan under consideration, non-native brown, rainbow and brook trout would be removed from the upper Gibbon (that means from Gibbon Falls, upstream through all the beautiful meadow stretches). In their place, the Park service would stock West Slope Cutthroat and Arctic Grayling until a self-sustaining population was in place. While native trout restoration is admirable, and I generally support it, this project cannot be called a restoration. According to dictionary.com, a restoration is a "return of something to a former, original, normal, or unimpaired condition." Based on the Park Service's own research, this plan for the Gibbon cannot be called a restoration as historically the upper Gibbon did NOT have trout. Throughout Yellowstone National Park one can fish for cutthroat trout. Right now, the more immediate concern in my opinion would be to find a way to remove rainbows from Slough, Soda Butte, and even the Lamar as well as increase efforts to reduce lake trout numbers in Yellowstone Lake. The Park has precious few quality brown trout fisheries and removing the Gibbon from the list would be heart breaking. 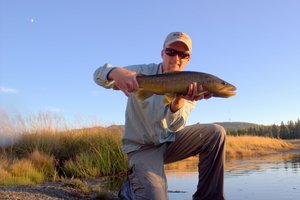 Craig Matthews, in the Yellowstone Fly-Fishing Guide, mentions that the meadow sections of the Gibbon contain large brown trout and offers opportunities to stalk wary brown trout that you won't get on many other Park streams. I support the proposal with one exception: I believe that the Gibbon River should stay as it is, except possibly above Virginia Cascades. The Gibbon is currently one of the best rivers in the Park for catching brown trout (including very large browns) and should be left as is. Removal of the brown trout fishery would have a detrimental effect on area businesses that cater to fly fisherman. Additionally, within the Conservation Plan Assessment, it refers to a quote from David Starr Jordan from 1891 which indicates that the upper Gibbon was at that point fishless. It seems fairly obvious (unless I'm missing something here) that the Gibbon project is not a restoration to the original conditions. With that in mind, I prefer to come to Yellowstone to catch brown trout in the Gibbon and not cutthroat. Remove the Gibbon from consideration for the project and I will support everything else whole-heartedly. Some people quit fishing through the cold months of the year, and that's just fine with me. 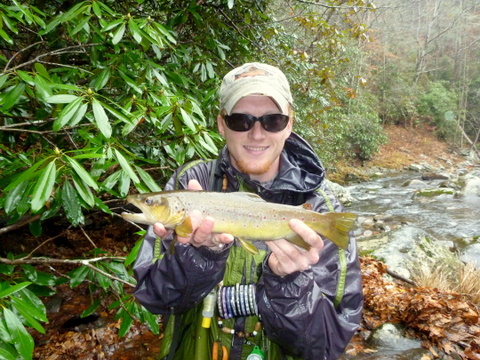 Getting out on the stream with little to no competition is a special experience, especially somewhere like the Smoky Mountains. After the mad days of spring, summer, and fall, wandering up and down Little River and maybe seeing two other anglers is a refreshing change of pace. Yesterday, I headed for the mountains to meet my buddy Travis from the Fishing Fanatic. We try to fish a few times a year, but often getting our schedules to match up can be a little tricky. Despite the cold weather, we decided to fish no matter what. Our original plan involved the South Holston but TVA's generation schedule has been a little strange to say the least. Plan B was to head for the freestone streams of the Smokies. After exploring our options, we finally settled on a good pool that always has a few willing fish. A smattering of midges were hatching so I suggested to Travis that he start out with some type of nymph (preferably a stonefly) and a midge as a dropper. From a good vantage point above the water, everything appeared to be completely dead at first glance. However, our patience was rewarded and we soon saw fish moving around on the bottom. The water was frigid but fish still have to eat, and they were moving around quite a bit. Travis completed his setup with some split shot and moved into position while I stayed put so I could spot fish. After a few casts, he was getting a perfect drift each time. Eventually the inevitable happened and his indicator dove under. Soon a beautiful wild rainbow was brought to hand, and I snapped a quick picture to prove we really did go fishing. Some people have a hard time believing that I fish in such weather so pictures are always helpful. We fished that pool awhile longer with Travis catching some more fish. Finally we decided to head downstream to try another spot or two. I picked up a nice rainbow at another favorite spot before we called it a day. For as much time as we were out, neither of us actually fished a ton. We both spent a good amount of time looking for nicer fish. None of the better fish we saw were in a good spot to fish to so we left them without harassing them. 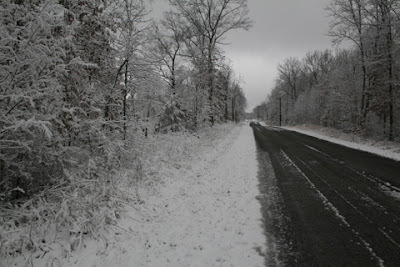 Here on the Cumberland Plateau of Tennessee, winter has arrived in a big way. Recent high temperatures have not been above freezing and overnight lows are getting close to the single digits. The first snowfall completed the appearance of winter with light snow showers stretching out over a couple of days. Waterfalls near my house have been forming large areas of ice around the base and as well as icicles off the rocks nearby. The Sandhill Cranes have mostly migrated south of the area but scattered flocks continue to fly over, hurrying towards the warmth and abundance of the southeastern U.S. The large fields nearby now have wintering raptors hunting their broad expanses. I have identified the majority as being Northern Harrier Hawks which usually appear around Thanksgiving and will be here until early spring. Since my car has been stuck, I've been getting my outdoor fix by hiking around near the house. This has provided plenty of great opportunities for my camera. On one recent hike, I even took the time to build a small fire to warm up while relaxing in the stillness of the woods. The wind whispered through the trees, but my spot at the base of the rock was still and warm. A waterfall around the corner was the perfect spot to spend a few moments with my camera. A large area of ice had formed at the base adding an interesting element to an otherwise common picture. 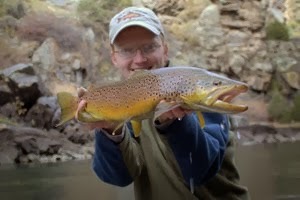 Stalking and sight casting to trout is my favorite aspect of the sport of fly fishing. Some days I would rather spend my time looking for fish instead of casting. Once a fish has been sighted, the real fun starts as a plan must be developed. That includes figuring out the best position to cast from, what cast to use, deciding what the fish is eating, what imitation will work, and finally putting everything together. Sometimes it turns out much easier. Recently, I was fishing a Smokies stream with my buddy Joe McGroom. 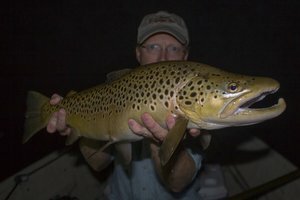 We were hunting brown trout which had finished spawning a couple of weeks prior to our trip. This time of year they are hungry and willing to eat a properly presented fly. I had a wooly bugger with a small dropper tied on ready to fish in the hope that the hungry fish would not be very picky. 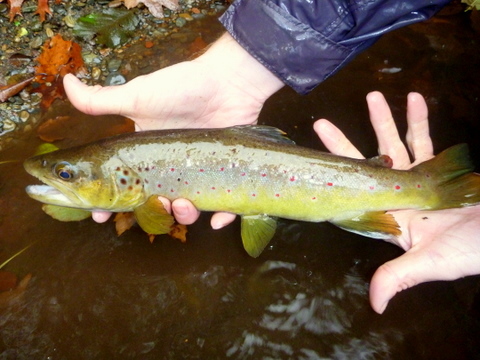 As we moved up the stream, the fish were noticeably absent from the places we expected them. Usually this time of year, the fish have moved into the deeper holes and slower runs, but can often be sighted in their favorite feeding lies. Despite our expectations, only a few fish had been found out feeding. We had walked about a mile and a half of stream and only spotted 3-4 fish up to 17 inches. Joe had only landed two small fish, and I had barely even cast but we were covering a lot of water and knew that eventually we would start finding fish. We were taking turns walking in the lead. I had just moved up to take the lead and was stalking slowly up the edge of the stream when I caught a flash of brown. 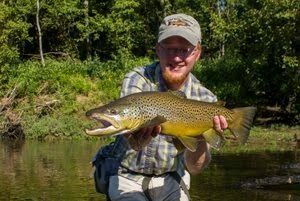 A nice brown was in the middle of one of the better runs. Immediately I froze. Joe crowded up behind, peering into the stream as I exlaimed, "There he is!" "Where?" was his reply. I was already stripping line from my reel. "Right there" I said as I dropped the flies 12 inches upstream of fish. Immediately it nailed the bugger, and I raised the rodtip. Joe didn't have much trouble seeing the fish as it tore around the stream trying to throw the fly. Soon I landed the fish and posed for a quick picture. The fish taped out at 15 inches which definitely isn't a monster, but at the same time was one of the most memorable fish I've caught this year. Later in the day I hooked another fish that would probably have gone an inch or two longer. This fish nailed the same fly as the first and went ballistic once hooked. Oddly though, after what felt like a good solid hookset, the fish simply threw the fly after about 3 seconds. I was left staring at its rapidly vanishing shadow which moved into a column of bubbles and disappeared for good.